This tutorial expands on the game play functionality that was introduced in tutorial Game 3-5-7 - Basic Functionality. By the time you reach this tutorial, you should be able to play the game 3-5-7 on a LiveCode stack. The additional functionality covered here shows you how to add a formal two player mode, restrict moves that are not legal and detect which player has won the game. In order to play 3-5-7 with two players, it is necessary to inform LiveCode when one player is finished and the next player is allowed to start. We can do this by adding a "Next Move" button. This button also serves as an indicator for the player who is executing a move at a particular time in the game. Add a button as is shown in Game 3-5-7 - A Simple Interface, set the button name to "Next Move", and set the button label to "Player 1", as is shown in the image above. These are the only interface changes required. All further changes are implemented in the code. The code described in the remaining steps replaces the code that was covered in Game 3-5-7 - Basic Functionality. You should copy and paste the code in the order it appears in this tutorial over the code that you already implemented for the game. In order to ensure that a player only removes buttons from one line, it is necessary to create a variable that remembers from what line a previous button was removed. We create a global variable for this, allowing the variable content to be visible from all parts of the remaining code. // which line buttons are being removed. If you decide to save the game for future play, we should reset the game when the card opens up. The following command handles openCard events and resets any game state to the game start state. This event handler calls a command that is described later on in this tutorial. // Reset the game when the stack opens up. The structure of the mouseUp command in this tutorial is similar to the structure of the mouseUp command in the previous tutorial of this series. We changed the command by added a condition for the new "Next move" button and replaced operational code segments with calls to commands that are implemented in future steps of this tutorial. Moving code into our own defined commands allows us to create a modular and structured flow of the game code. // Specify a delimiter that allows you to select an item in a line of text. // Get the name of the button as was specified it in the Property Inspector. // Test if the mouse click comes from a button or something else. // type of control that sent the mouse message. // If the reset button was pressed then reset the game. // then allow the next player to make their move. // If a game button was pressed, then remove that button. // is a losing state for the current player. 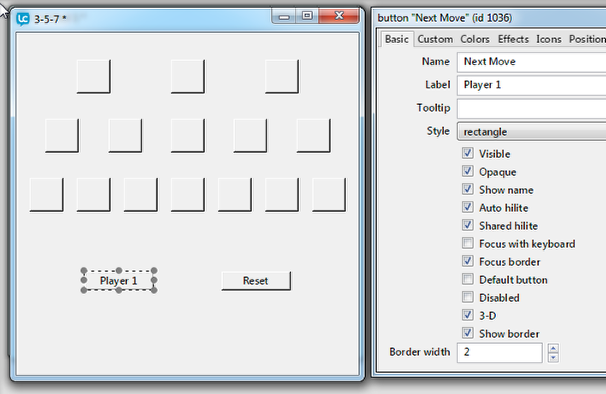 The resetGame command shows all the hidden game buttons and updates the label of the "Next Move" button to indicate that "Player 1" should start the game. The variable gCurrentPlayLine is also set to empty, allowing the player to select the first game button from any line that contains buttons. // Loop through all the buttons on the card. // Make the button visible that we are currently pointing to. // Set the label of the next move button to Player 1.
set the label of button "Next Move" to "Player 1"
// Ensure that the player can start selecting from any line. 1. Indicate that the next player can play. 2. Allow the next player to remove the first button of the move from any of the three lines of buttons. We switch the label of the "Next Move" button by testing the existing value of the label. If the label is "Player 1" then switch the label to "Player 2", otherwise switch the label to "Player 1". The variable gCurrentPlayLine is set to empty in order to allow the next player to remove buttons from any one of the three lines of buttons. // If the next move button displays Player 1, then switch it to Player 2.
set the label of button "Next Move" to "Player 2"
When it is a player's turn to make a move, the player can remove any number of buttons from only one line of buttons on the board. The initial button selection can be from any line on the board, but subsequent button selections must be from the same line from which the first button was removed. This behavior is implemented by using the gCurrentPlayLine variable. Before a player makes a first move, this variable is empty, once the player has made a move, this variable is assigned the line on which the button was stored. A test in the command described in this step test if gCurrentPlayLine is empty or if a value is set and matches the line number of the button to the value stored in the variable. The line number is stored in the name of each button and we access this number by stepping through the space delimited items in the button name. If the player tries to remove a button that is not on the same line as the first button that was removed, then the player receives a message, indicating that the button selection was illegal. // Test if the player is allowed to take that button away from the board. // was removed into gCurrentPlayLine. // If this was an illegal move then inform the player. answer "That is an illegal move. Only take buttons from the same line." with "Okay"
After every move, a test is carried out to identify if the current player is the winner of the game. The test loops through all of the controls of the board and tests for a game button that is visible. If such a button can be found, then the game is not over and the test terminates. If a visible game button cannot be found, then a message is raised, indicating that the current player has won the game. Have a look at the last line of the code to see how this test identifies which player is the winner. // Get the name of the button that we are currently pointing at. // If the button we are currently pointing at is visible, then exit this test. // then inform the user that they have lost. answer the label of button "Next Move" & ", you have won." with "Okay"
I am getting the notification that I won everytime I click any button I have copied the code exactly... is anyone else getting this problem or know why I am getting it? this lesson is the last one in a set of three. If the buttons are not named properly, then "testForWin" assumes that all playing buttons are invisible and the last person playing selected the last button(s). it has to do with how you copy and paste the code from the pdf. double check every line to make sure that all of the executable code is NOT in a comment line! That was my issue. yes, when you copy and past the code from the lessons, then you can get certain characters that do not paste directly into the LiveCode Script Editor. It is necessary to remove characters at the beginning of each line. I wrote took the first two parts of this tutorial and everything worked flawlessly. However, with this tutorial, nothing is happening when I click on a button. It doesn't matter which button I click, nothing is happening. I did not copy paste the code, instead I wrote the code literally as written in this tutorial, but without the // green sentences. Do I need this green sentences in my code as well? I thought they are only there to clarify what you need to do, and in the other parts of this tutorial it worked without this code. I double checked and everything is the same as here. I wrote the code down in chronological order as in this tutorial, so starting from above with local gCurrentPlayLine etc. After each piece of code I have a return, but I tried with and without return, nothing changed. Is there anything else I could have overlooked? i get the same problem with Ellery, every time i click a button the notification pop-up that it is an invalid move. I think this reply is relevant to everyone who has so far posted comments to this lesson. I have attached a sample stack that implements the functionality of this lesson. This should take the pain out of copying the code in the lesson and formatting it. This game implements basic two player functionality and does not provide any artificial intelligence that allows the computer to play against a human player. So the "Player X" button indicates what human player is currently playing. If one player is finished making their moves, then they should hit that button. The button toggles the number between 1 and 2 and the next player then makes their moves. When the next player is finished, they then hit the button, and so on, until the game is over. I hope this addresses a number of issues you may have been having with this lesson. Even when I use the stack that is downloadable from this lesson. How can I avoid those indications? I have tried the supplied stack as well as my own written code following the tutorial but then i m having same problem like Wouter De Backer. After building standalone program for Mac osx. When running the program, i got revGeometryBack & revCommon button. Any advice on how to get rid of these buttons? appear on top of the buttons. Some libraries in LiveCode are saved within buttons and these are included when a standalone is built. This will also explain why you will not see them in the IDE.